Add a finishing border to your displays, windows, doorways or chalkboards. Vibrant colors plus a variety of styles and themes can add creativity anywhere you choose. 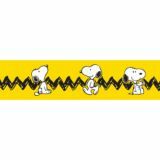 Includes 12 strips 37" long, regular width 2.25".